Thanks for taking the time to read our review of the Forest Master 5 ton electric log splitter. This is an hydraulic option, powered by electric, and is a popular choice for many UK home owners, who have a wood burning stove. 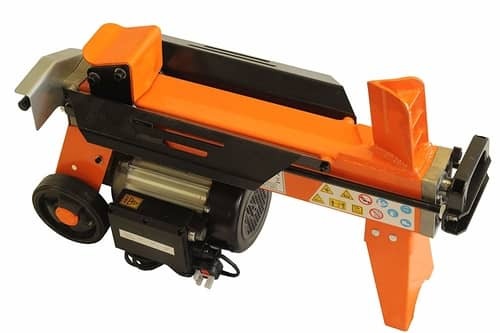 This model will split logs up to 370 mm in length (14.5") It will not be able to handle logs longer than that, so just be certain when you are making your purchase, that this log splitter will match your needs. In terms of width of logs it can handle logs up to 25 cm in diameter (10"). As log splitters go this one we believe is fairly priced. It has an RRP of around £250, and online buyers have rated this splitter with a 94% buyer satisfaction. That is a strong indication of just how effective this model is. The bottom line with this model is that it is just a great deal faster, and a lot less work than using an axe, or a club hammer and splitting wedge. It is also a great deal easier with very little manual work. Just below we have included a quick index, so as you the reader can jump to the section that you want to read more about. Who Would or Should Buy the Forest Master FM8 Model? What the Online Buyers Said? Log splitters come in different shapes and sizes. As you would know these need to be tough, durable and very well made. The motor that powers these is the most important part in the whole machine. The bigger the motor, then the more power it can generate. The motor then powers the hydraulics which does the actual splitting. This particular motor is a 2,200 watt motor. Similar models to this one will use a 1,500 watt motor, so in terms of sheer power, this Forest Master model is certainly much better than most. The people who buy this model use it for splitting logs that will be used in small to medium sized log burners. 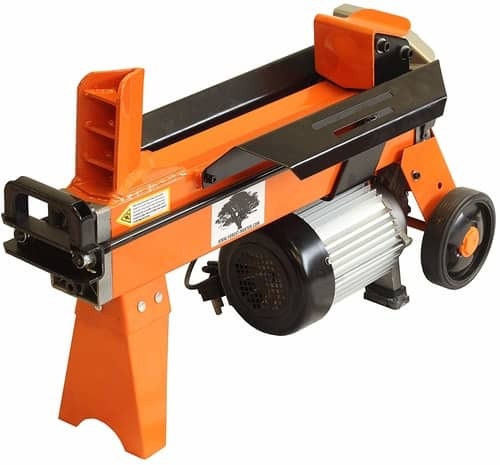 Just remember this one can handle logs cut down to 37 cm (14.5" in length) and 25 cm (10") in diameter. The Forest Master brand is an award winning designer of log splitters, log holders, wood chippers, stump grinders and saw horses. Their UK offices are based at Industry Road in Newcastle Upon Tyne. Many buyers of electrical garden tools like to know the full technical specification, so we have provided that below. We have also provided some information, that helps explain what these actually mean, when it comes to using the machine. We have included a video of this log splitter so as you can see how it is used. In this section we examine how buyers have rated this log splitter, and we have also included what buyers had to say about this model. We find these very useful, as these are real life UK buyers, who have used the splitter, and then taken their time to leave a review. Those are of course people just like you and me, and their feedback is a very useful way of understanding the full user experience. As you can see from the ratings, this FM8 model gets excellent reviews. It is always good to see that not a single buyer gave this splitter a bad review. So we now know that this FM8 model costs around £250 and gets an excellent 94& buyer satisfaction. However, we also like to summarise what these online buyers said. We have done that below, and we have included the good points, and we have also included any short comings, that this model might have. As you can see this model gets excellent ratings from online buyers. In this section we like to discuss the key important features, that we believe make this model work for most buyers. As we mentioned earlier in our review, the motor that drives the hydraulic arm is vitally important in all log splitters. This FM8 model has a powerful 2,200 watt motor and that generates up to 5 tons of torque or pushing power. It is this pressure that helps split the log. The more powerful motor also does not come under as much pressure as a smaller motor, and as such will certainly last a great deal longer. This model does not come with a "Duocut" blade, but we think that this option is well worth considering. The machine as it comes out of the box has an angled blade at one end. The hydraulic arm has a flat or flush plate that pushes the log against this blade and splits the log. When you fit a "Duocut" blade, that flat plate is replaced with another angled blade. As such it splits the log from both ends, which speeds up the entire process. 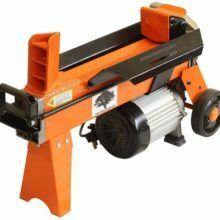 The disadvantage of this though, is that will reduce the length of log that you can split from 370 mm (14.5") to 300 mm (12"). That is because the new angle plate uses up 70 mm of the available length space. All electrical machines are dangerous if not used properly. There is a very strong temptation when using a log splitter to activate the machine, and then try to hold the log down to split it. That is almost an instinctive use. It is also a highly dangerous practise as you can easily get your arm or hand accidentally crushed. All high quality splitters now have a two handed operation to stop users from doing this. So you now have to push a button with one hand, and also push a lever with the other hand. That keeps your hands away from the log and out of danger. We are not going to argue with the buyers on this model, and certainly not one with a 94% buyer satisfaction rating. This is a great choice for those who want to split logs for a small to medium size stove or fire. There is very little setup required, but of course it is always a good idea to read through the set up guide and read the instructions. The bottom line is that this splitter is all about saving time and taking the manual work out of the log splitting task. 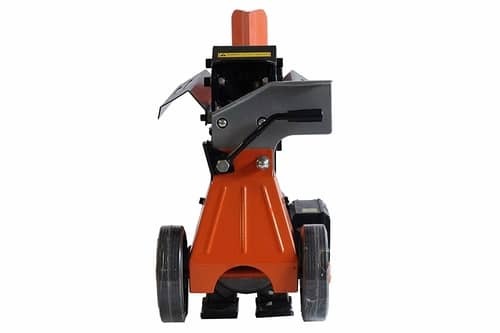 We would have no hesitation in recommending this Forest Master FM8 log splitter to you. The price is fair and the reviews are great.